LONDON, ENGLAND (July 10th, 2018): Join Starfleet’s miracle workers or its steadfast defenders with The Operations Division supplemental rulebook for Star Trek Adventures, this November. Leading the writing team is Chris McCarver (Marvel Cinematic Universe Guidebook) alongside Andrew Peregrine (Dr. Who: Adventures in Time and Space, Firefly Roleplaying Game), Jack Geiger (Scarred Lands, A Song of Ice and Fire RPG), John Snead Blue Rose, Eclipse Phase, Mindjammer), and Sam Webb (Star Trek Adventures). 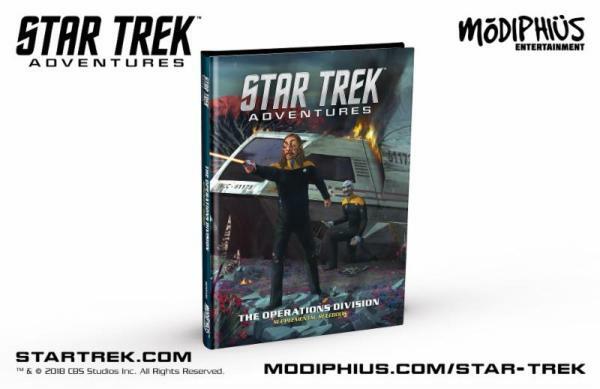 Star Trek Adventures uses the Modiphius 2d20 game system, designed by Jay Little (Star Wars: Edge of the Empire, X-Wing Miniatures Game) and developed by Nathan Dowdell (Black Crusade, Only War, Mutant Chronicles 3rd Edition, Conan: Adventures in an Age Undreamed Of, Infinity The Roleplaying Game). Star Trek Adventures, under license from CBS Consumer Products, has had an incredible reception from critics and fans alike, and the core range is still available from both Modiphius.net and friendly local gaming stores. To create the first new Star Trek RPG in more than a decade, Modiphius brought an all-star development team together, comprised of veteran Star Trek artists and authors, world-class game designers, and brand new gaming talent. TM & © 2018 CBS Studios Inc. STAR TREK and related marks and logos are trademarks of CBS Studios Inc.